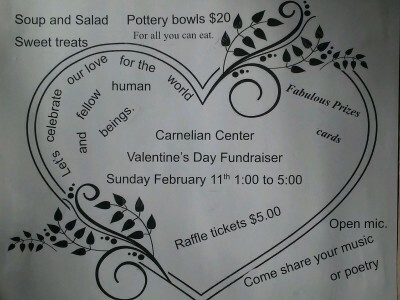 Let’s celebrate our love for the world and fellow human beings at the Carnelian Center’s Annual Valentine’s Day Fundraiser! Join us Sunday, February 11th 1:00 – 5:00 PM at the Carnelian Center (next to the post office) for soup and salad, pottery bowls, sweet treats and amazing raffle prizes (raffle tickets available at Zuly’s and the Co-Op). Come share your music or poetry at our open mic. • Discounted treatments available for community members in need.